I'd like to take a second this morning to introduce one of my newest sponsors - tinder. 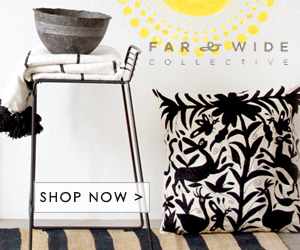 Tinder is a small, local Canadian online store that specializes in general (and beautiful!) household goods and sundry items. It was founded in 2008 in a forested ocean cove in windswept Nova Scotia but now calls the Big Smoke (aka Toronto) home. In England you see these laundry drying racks everywhere. I'll never forget staying at a posh pied a terre around the corner from Harvey Nichols and marveling at this ingenious clothes dryer that went up and down over the kitchen island every night. A brilliant idea for small spaces. I've looked for these before and never seen them for sale in Canada until now. I've expressed my love for the Fog Linen apron before. You really can't beat the beauty of linen and these aprons have such simple, classic lines. I'd wear one all day! I love the utilitarian look of these wire baskets. A wire letter basket is also available. You've probably seen one of these in the inspiration photos of your favourite rustic farmhouse French kitchen. It's a herb dryer and perfect for this time of year. Can you imagine how amazing your home would smell as you dried thyme, lavender, and rosemary? Finally I love these recycled wool blankets made from 100% pure British wool. Made in the Welsh countryside they are perfect for picnic, roadtrips, or at the foot of your bed. You know I can't resist a good blanket! Tinder also donates 5% of its profits to a small number of Canadian worthy causes including the Canadian Honey Council and the Canadian Red Cross. Hop on over and see what you might find for your home.